Stewart Wennen - "My side of things"
My background has not been steeped in Soul music, although I used to go to Clubs in the early seventies where Soul Music was played. I used to listen to Blues and Rock to the exclusion of almost all other types of music. Although as I have grown older I have developed my listening taste to include Jazz, Soul, Opera, and classical music. I first entered the Electrical Industry as a snotty nosed Apprentice Electrical Engineer. I served an Indentured Apprenticeship for five years. I then went to the University of Leicester where I received my Degree in Electrical Engineering. During this time I was going to gigs very regularly and also worked on a Radio station and learned the basics of Sound reproduction, which included mixing live shows, tape editing, repairing equipment, and of course building cable looms. My first exposure to the Hi Fi industry was at a small company in Southampton who designed and built Loudspeakers. I learned to build and veneer a cabinet and to finish cabinets during my first two or three years with this company. As time went on I became a Research and Development engineer and also started to design loudspeaker systems. We also built and designed Front of House Public Address Systems and I became heavily involved in this part of the business. As a matter of expedience I was a Consulting Engineer to some of the worlds primary Hi Fi and PA manufacturers. I have worked throughout Europe, America and the Far East. I also ran a Hi Fi shop in Southampton for some years and relearned my trade to cope with the Retail Public. Working with people was entirely different to working with cabinets, drive units and design schedules! I have toured and recorded with various Bands and Solo Musicians. The most notable of these was G.P.Hall who plays Flamenco Guitar and various electric guitars. I first met Steve Naylor and Pete Haigh at a small club in Blackpool about 12 years ago and the friendship developed from that point. I was later to meet Andy (Epic) Lett. I am fortunate to work with some of the most innovative and professional DJs in this country. My experience has been varied and I have learned most of my trade from the mouths of others. Of course reading is another part of the learning curve as well. When checking out new venues there are a number of stages before agreeing to use it. The first of these is to determine the acoustic delay the room displays. Ideally the delay should be about 50 microseconds. Any more than this will lead to a very jumbled sound any less than this will give a very “dry” sound. Of course there is no such venue that has the “perfect room” so compromise using my years of experience is essential at this point. As a result of these compromises sound quality can suffer but with careful equipment positioning they can be minimised. The 240-volt mains power should be isolated at the fuse box with at least a 45-amp circuit breaker; stage boxes are isolated with multiple circuit breakers and multiple sockets. Our rig uses 15 single 240-volt plugs so one socket is not enough. We prefer not to be isolated on a stage, rather we like the intimacy that being situated on or near the dance floor with our front end (mixer and decks) affords. Stages are also prone to “footfall” interference and acoustic feedback. Ideally the front end should be sited on a solid concrete floor or swung (flown) from the stage gantry. Positioning is often compromised due to the room construction. If the position of the front end is not ideal then lateral thinking is applied to use the space to our best advantage. The dance floor should not be connected to the stage or the final position of the front end this is to obviate the previous points as to feedback and footfall. Loudspeaker position ideally should be between 15 and 30 feet apart with a toe in to focus the sound on the dance floor. This is an inexact science but in my experience running loudspeakers with the front of the cabinets parallel with the wall behind them gives an extremely wide stereo image but the bass response is limited, extreme “toe in” of loudspeaker cabs give a very narrow stereo image with very “tight” bass reproduction, again compromise is the name of the game here. Finally ease of access is another important point to be considered. If the room to be used is on the first floor, or above, it is essential that there is a service lift to get the equipment up to the desired level. This lift should have a load tolerance of twice the weight of our heaviest piece of eqpt. After all the finest room in the world is no good to us if we cant get our rig in! The Rig (sound system) we use is as the result of our experience with rigs that don’t work properly, sound awful, and damage hearing! We decided what we wanted from our sound system and came to some conclusions that would be expensive! 1) The Rig would have to be very powerful. 16) All of the rig should be rack mounted. First of all we modified Steve’s Technics SL1200 turntables with new pick up arms and new cartridges. This improved the performance of the standard turntables by a large amount. We use Technics SL1200 Mk 2 turntables equipped with Origin Live Silver pick up arms. Cartridges (needles) we use are either London Professional or Stanton 890. Technics SLDZ1200 not modified at all. We chose the Rane because Steve has always wanted one rather than the Cloud modular desk or the Formula Sound modular desk. Although the cost of each desk was similar. We decided that we would use specialised Disc Stages, as these stages in most desks are pretty poor. Of course they would add a little complexity as far as wiring them in was concerned. The desk we are using as the main unit is a Rane along with the optional Equalisation/cross fader unit. 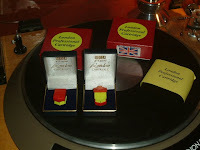 We also use three Disc stages from Graham Slee these are known as RIAA (Recording Industry Association of America) stages. We have a Numark mixing desk as the spare unit. We have designed and built discrete support stands for the front-end equipment. We chose these Loudspeakers because they were built entirely in the UK. Precision Devices have an enviable reputation as far as reliability was concerned. Mid packs using two 12 inch mid bass drivers and a treble unit. Upper bass bins comprise of two 15-inch drivers in their own cabinets. Sub Bass is taken care off with an 18-inch driver in its own cabinet. All of the above cabinets are loaded with Precision Devices drive units. The second sub bass cabinet is of the ½ wave scoop type equipped with an Eminence 18 inch drive unit. This is for one channel so multiply this by two for the total cabinet line up. All of these loudspeakers have been modified to be run as an active loudspeaker rig. We currently use Citronic PPX power amplifiers. I chose these because I was familiar with their bullet proof build quality, and they were built in England and they were relatively easy to repair. PPX 900 for treble use. We rotate these amplifiers and run them twice weekly so they are kept in good condition. We have a variety of active crossovers but we mainly use another piece of Behringer eqpt. We also use a Cloud distribution amplifier for multiple sub bass routing. All of this equipment is housed in a custom built Rack mount which houses three of the power amplifiers as well. Graham Nalty from Black Rhodium supplied mains bus cables. They are the big purple cables and are constructed from silver plated copper and each core is 4 mm in diameter. WHY DO WE USE AN ACTIVE LOUDSPEAKER SYSTEM? What is the difference between an active loudspeaker and a passive loudspeaker? Don’t worry this is not difficult to understand. First of all we will look at a passive loudspeaker. This is a loudspeaker that has a crossover inside the loudspeaker cabinet and the drive unit(s) as well they generally use one amplifier. The passive crossover sends the signal to the correct drive unit at the right power level. The crossovers soak up a vast amount of power, up to 30% of the amplifier power, and distort and compress the music. Most of the loudspeakers sold for domestic HiFi systems are of this type. An active loudspeaker system does not use a crossover inside the cabinet thereby reducing distortion and compression. The electronic crossover is housed in a separate case and the each power amplifier is in turn connected to the correct output on the rear of the case. The power amplifiers are directly connected to the relevant drive unit. This gives better control of each drive unit, increases “headroom” reduces distortion and also is extremely reliable. Another advantage of active control is the ability to have a much higher SPL (sound pressure level) so we can get kidney punching bass along with a sublime mid range coupled with a sparkly treble reproduction. Although rather complicated to set up, initially, the benefits are substantial. Once set up this system probably cost as little as a passive loudspeaker system to maintain. I have a planned system maintenance schedule, which ensures that the rig is in top line condition at all times. I regularly check and test each piece of equipment and also provide Portable Appliance Test certification for the equipment. This is essential for our Liability Insurance to be active. We are extremely protective of our rig, not only because of the cost but we have scrimped and scraped to purchase it over quite a few years, but because this rig has took an inordinate amount of care and effort to build. So if you are ever invited to play out on our rig we are giving you the highest compliment we can bestow. This rig has been built to be simple to operate although the mixing desk feels strange at first due to the absence of slider controls. All the DJ has to do is to make sure that he, or she, doesn’t overdrive the output of the desk. So maximum output level is set at 0dB, in other words keep the desk “in the green” neither the red nor the amber! The analogy that springs to mind is, using the rig is like driving a super car rather than a small family hatchback, the family car will get you to the end of the journey but the super car is much quicker and the experience of driving it will stay in your memory forever! 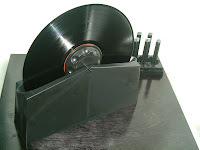 As all of the record collectors are aware all vinyl seems to have noise built in to it! This is easy to get rid off; all we have to do is to clean the records. Not using tap water or any form of paint stripper, yes I have seen this done by a shop in Blackpool. Needless to say I have never bought any vinyl from this shop since! We use a couple of bath type cleaners and a professional cleaning machine for all of our vinyl. The results are worth the investment; absolutely silent surfaces and they look so good once cleaned. After all most of my friends who collect vinyl have a lot of records and we worked out that a record cleaning bath costs about 15 pence per record to buy and maintain! The job I detest the most is checking and testing all of the cables we use, because this is the most time consuming job of all. Our signal cable loom has over 200 solder joints in it and each joint has to be checked tested and rebuilt very regularly. We rarely have breakdowns on the rig, this is due to the active maintenance schedule, and of course the care we take with the sound system. Inevitably from time to time some of the equipment needs replacing this is due to general wear and tear but in the main this happens rarely. Although cables need rebuilding from time to time. As I have been in the PA Industry for a number of years it seemed logical to engage with manufacturers of equipment to provide them with a Research and Development service. The first of these was Mark Baker at www.originlive.com. We suggested to him that there was a large untapped market for DJ pick up arms, so we began work on the OL 250 at first. We used these arms for a few years and have changed them for Origin Live Silver arms. These are amongst the finest pick up arms that are currently available. We approached Len Gregory of www.thecartridgeman.com for some help with pick up cartridge set up tools and he agreed to supply us with a Hi Fi News test record and alignment gauge as well as one of his Digital Level Gauges. These are used instead of a conventional spirit level, being electronic they are much more robust. 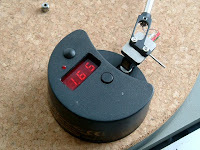 He also supplied us with an Electronic Stylus Pressure gauge again this is an extremely accurate tool and very easy to use. These tools have made the setting up of carts much easier and quicker. One of the most useful of our sponsors is KRM Audio based in Blackpool. Karl Mather is one of my most trusted friends and can generally repair equipment quickly and safely. Due to my industry contacts we have been supplied lots of bits and pieces for our rig and the list is almost endless and would take an age to write up so if you see us using something you have not seen before please ask and we will tell you where you can get it from and how it works! You may think that these units cost us nothing; well they cost us up to five years hard work with the relevant manufacturer as well as some money too. I would like one day to use and own Klarke Tecnic outboard equipment, graphics and compressors etc. Also I would love to be able to replace the power amplifiers with Lab Gruppen units. Although I doubt if I will ever be able to achieve this as these units cost a great deal of money, and I am sick of eating beans! We built this system to play music on. Often at spine bending levels, with kidney punching bass delivery and Hi Fi performance. If you have read this far, congratulations, and come and have a great night at our next gig.